Gutenberg is a new way to edit content in WordPress. It is named after Johannes Gutenberg, who invented a printing press with movable type more than 500 years ago. His invention started the printing revolution and reduced the cost of printing books and other documents, making them more available for common people. And now WordPress, like Johannes Gutenberg, is looking to change publishing with a drastically new and improved content editor. As now you know why it’s called Gutenberg let’s move on and explore it more deeply. The main concept of Gutenberg is that everything is a block. That means all your content you add to your posts or pages, like paragraphs, images, quotes, galleries, videos and etc. are blocks and all these blocks are treated individually. They can be moved around and modified with settings that are specific to each block. The new editor will have default blocks (Common Blocks) built-in, like the quote, link, button, gallery and etc. 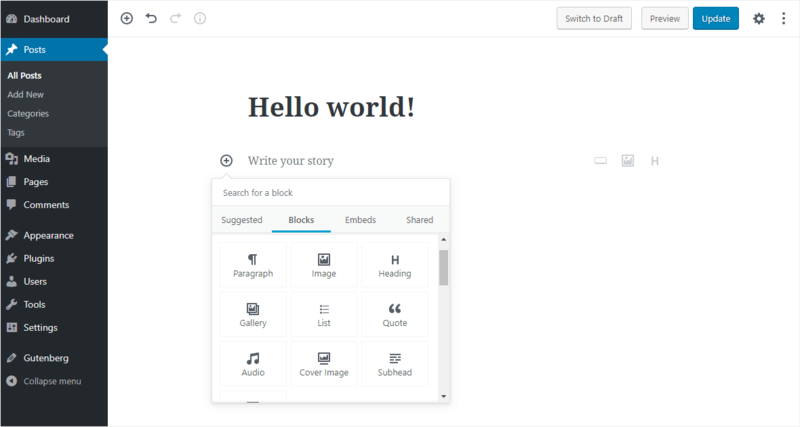 Common blocks in the new editor – Gutenberg. And if you need the specific block for your site that Gutenberg doesn’t have you will use the plugin for it. Why WordPress needs new editor? TinyMCE, the current WordPress editor, is too simple. Don’t get me wrong it is a good editor but for today’s world it is outdated. People expect more flexibility and functionality for post/page editing. And they want to create more expressive, complex layouts without coding. To achieve this with TinyMCE you have to use shortcodes or page builder plugins. For first time users, it is the frustrating experience as you not only have to learn WordPress but various others tools in order to get what you want. Gutenberg will solve this problem. Out of the box without any extensions, you will have the power to arrange content how you want. With Gutenberg, editing and publishing posts will be much easier. It will reduce the visual difference between how content is created in the admin dashboard and how it is rendered on your page. Important to note! Gutenberg is still in active development and it is beta software. The best place to try out is the local or staging environment. If you are trying on your live site make sure you have a backup and you can easily revert back if something goes wrong. To try out the new editor, you can download and install the Gutenberg plugin from official WordPress.org plugin directory in your WordPress dashboard. Also, there is a live demo site to see how Gutenberg works. You can view it here -> Gutenberg Live Demo. If you want to know more about this editor please visit the official Gutenberg page on WordPress.org. At Just Good Themes we are excited about the new WordPress editor – Gutenberg. We think it will be a positive change in WordPress world and it will bring powerful tools for you to create more expressive content. There are tons of things you can do with it and now we are experimenting and building various blocks to try new things out. As for our theme collection, we promise you that all our themes will support the new editor when it launches in WordPress 5.0.